One of the questions I get regularly is about which incentives to offer to employees. The immediate return question is : “What do you want to accomplish?”. There are many books written about incentive design, but the most important question is always about your company, your department, your employees and there is no book written for that specific case so you’ll have to do some work and develop your own specific view on incentives and your specific design. Motivation Incentives are part of motivation. Motivation is anything that targets behavior change. Offering money when a certain milestone has been accomplished is one form, offering a lavish vacation when a huge order has been granted is another form. The end of year profit sharing is part of it as is the annual performance bonus. Also promotion as a reward for doing a particular job well for a specific time can be seen as an incentive and then you have the “employee of the month” programs that aim to create both role models and motivate by public acknowledgement. For a sales organization the design and implementation of the sales incentive program is traditionally a huge deal. The various forms of incentives all have in common that they need to provide a piece of feedback to the employee such that lessons can be learned and a certain behavior can be created, continued or avoided. Giving inadequate feedback will trigger unwanted responses and you’ll get behavior you would have rather avoided. Every organization works with incentives. Even the most dull government organization provides incentives by appreciation from co-workers or management or even the public. 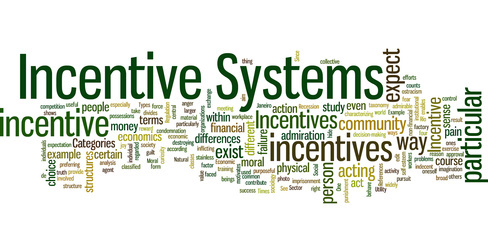 Planned or unplanned, incentives are everywhere. Likewise, feedback is everywhere and employees do react on it. As a fan of the Two Factor Theory by Herzberg (1959), we need to explain that motivation is provided by getting the motivators right and de-motivation is avoided by getting the hygiene factors right. As salary and benefits are regarded as hygiene factors, the question may come up how monetary rewards can be used as motivators. The HBR has been kind enough to publish an excellent article on this and it turns out that indeed salary is not a very good predictor of job satisfaction. There is another consideration though. One of the hygiene factors that potentially can lead to de-motivation is salary. In fact the hygiene factors incorporate all the monetary rewards and benefits and thus you can conclude that if it is customary in the industry to provide a certain kind of incentives, this now becomes part of the hygiene factors and if your company fails to get it right or does not provide it at all, your staff will become de-motivated. So with this curve ball we are back to designing incentives, bearing in mind that we cannot be too different from the comparable industry as employees will compare but at the same time realizing that not one size fits all in incentive design and the “best practice” may very well turn out to be the “most common” practice and not be the best for your situation. The most important part of incentive design is thinking through exactly what behavior you want to create, change or modify. If you want to boost sales, you could provide incentives to find new customers. To avoid your sales force to only work on new customers, you can build in a disincentive in case they loose a customer. You could also set targets and provide extra rewards once those sales targets have been met but there are lots of options to game the system there. When setting productivity targets for a factory or department the pitfalls will be in what to do with necessary trial runs that impact productivity, lack of customer demand that creates inefficient use of materials or unsafe behavior in order to work fast to get the rewards. Setting and rewarding safe behavior is yet another area with lots of issues. Setting annual targets may have employees totally loose interest when something happens in the second month of the year. Also setting targets based on no accident may trigger the employees to game the system and not report on incidents. A compensation or Human Resources professional should be able to help you out with thinking through the design. In a future article we may cover some of the legislative and tax issues related to incentives. Also in a future article we will cover the implementation as an incentive program is only as good as its implementation. This post does not allow for a review of all incentive design problems and angles and as said above incentive design is very specific for your company and situation. Although the design professionals can help, you as the manager/leader will need to provide all input to ensure a successful incentive program. Coming back to the Two Factor Theory, we also need to continue to bear in mind that however great our incentive program will be, the real motivators are in the intrisic part of the job, meaningful work, knowing where your contributions fit in the larger picture of the company and a boss who provides coaching and support. Good luck and don’t hesitate to ask us some questions. Tagged incentive, motivation. Bookmark the permalink.